Tehran hopes the transfer marks the first step toward building more plants, but Russia is hesitant. After 37 years of construction, Russia has handed over operations of the Bushehr nuclear plant to Iran. Russian specialists will continue to work at the site for the next two years advising staff and providing technical support, but the plant is now under Iranian control, according to Ali Akbar Salekhi, head of the Atomic Energy Organization of Iran. The plant began operations on Aug. 21, 2010 when nuclear fuel was delivered into the reactor building of the under the supervision of inspectors from the International Atomic Energy Agency (IAEA). This past July, the first unit reached its full capacity, but the official transfer of the operation was delayed until a series of tests could be conducted. Tehran hopes to begin work on the construction of a second power unit with the same capacity of 1,000 megawatts in the near future. According to Salekhi, negotiations with Russia on this issue are ongoing. “The parties, during the last meeting of the Intergovernmental Commission of Iran and Russia on Economic Issues, came to an agreement on the construction of new nuclear power plants,” Salekhi said. Iran plans to construct three new power units: two in the short term, and one in the longer term. The Bushehr site allows for the construction of a total of four power units with a capacity of 1,000 megawatts each. However, the site for these power units must first be approved by the IAEA. 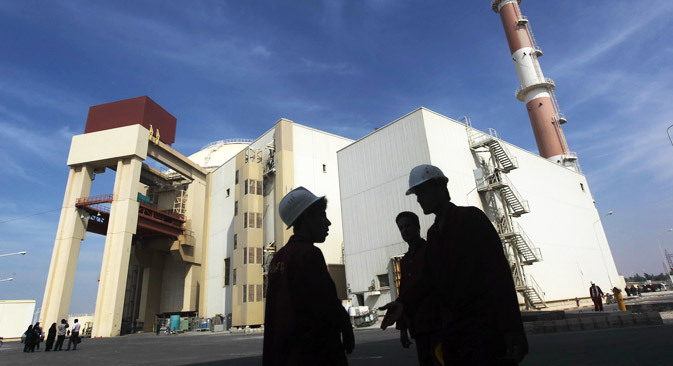 Bushehr is the first nuclear power plant in the Middle East, and the longest-delayed construction project in the region. The construction of the power plant began in 1974 under a contract with Siemens, but Atomstroyexport, Russia’s nuclear power equipment and service export monopoly, took over the project in 1998. Russian state nuclear agency Rosatom considers Bushehr a unique project with no analogues anywhere in the world because Russian equipment had to be integrated into construction works made to German designs. Russian engineers also had to use about 12,000 tons of German equipment. Experts are cautious about the prospects of Russia's participation in the construction of other power plants in Iran. On the one hand, building nuclear plants is profitable and if Moscow declines additional projects, another partner – most likely China – can easily be found. However, Tehran is currently subject to international sanctions, which are depriving Iran of $40-50 billion annually, according to Vladimir Sazhin, a senior researcher at the Institute of Oriental Studies at the Russian Academy of Sciences, reported RIA Novosti. In addition, international banking transactions are no longer possible in Iran; the SWIFT banking system stopped working with Iranian banks in 2012. “Even if Iran will find the money, how will it transfer the money officially? Many countries now owe money to Iran, e.g. India, China, but they cannot transfer this money to Iran in the usual way,” Sazhin said.